A bud of rose is often known as “queen of garden”. The plant is from the genus of Rosa. 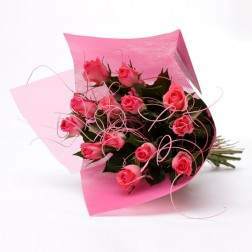 This exotic presentation of 12 beautiful pink roses is a gift of your affection and love. The bouquet is adorned with ting ting floral supplies and luxury wrapping. It is a perfect gift to express your affection and love to your special someone.